In the new animated gem 'Rocks in My Pockets', Latvian-born artist and filmmaker Signe Baumane tells five fantastical tales based on the courageous women in her family and their battles with madness. With boundless imagination and a twisted sense of humor, she has created daring stories of art, romance, marriage, nature, business, and Eastern European upheaval - all in the fight for her own sanity. 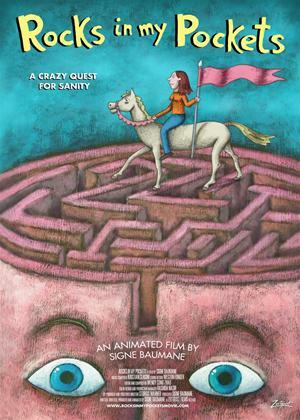 Employing a unique, beautifully textured combination of papier-mâché stop-motion and classic hand-drawn animation (with inspiration from Jan Svankmajer and Bill Plympton), Baumane has produced a poignant and often hilarious tale of mystery, mental health, redemption and survival.